Fun With Frisian: OM - "round, for, at"
OM - "round, for, at"
Welcome to Fun With Frisian, a very random exploration of a delightful language! So, last Friday I happened upon a beer tasting. Microbrews, of course: we're talking about beer, not water. The Ommegang Brewery had the best samples, and I asked what the name meant. They said it's Flemish for "walking around" or "walking all about." How similar to Frisian! Om shows up in word combinations. E.g., omgean, "to go round, to frequent" from P. Sipma's free book and glossary, linked to the right. Pronounce the om part with an "aw" like in "paw" or the meditative chant "om." The -ge- part is pronounced with an short "ee" sound, like in English "gee." The -an part has the loose, undistinguished vowel sound (schwa) that shows up in the second syllable of the word "nation" or as an exclamation of pain ("uh!") if you drink too much Ommegang beer. In omgean, the stress is on the first syllable. AWM-gee-uhn. Let's look at om in a sentence. Stil is 't rounom. 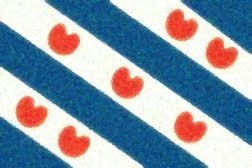 Frisian roun, pronounced like the English word "rune," means round. Rounom means "on all sides, everywhere." ROON-ohm... keep that long "oh" sound with the om. Is is the same as English in both looks and sound, but I repeat myself. The apostrophe-t is short for it, meaning "it" or "the." It looks just like the English word "it," but Sipma advises us to use that loose schwa sound with it too. The full word sounds more like "uht" rhyming with "nut." Stil is pronounced just like "still" and means the same thing: "still or quiet." Stil is 't rounom (old spelling). Stillness is all around. Even on a Friday night.